The University of Toledo Department of Psychiatry has been named an Associate Member of the National Network of Depression Centers (NNDC). The NNDC is a consortium of leading academic medical centers working improve treatment options for people suffering with depressive and bipolar illnesses through accelerated research and education. “The University of Toledo is excited to join the NNDC,” said Cheryl McCullumsmith, M.D., Ph.D., Professor and Chair, Department of Psychiatry, University of Toledo College of Medicine and Life Sciences. “We are focused on researching and treating mood disorders, especially in the context of complex medical and substance use disorders. One particular area of focus for us is to provide the appropriate level of care in the appropriate setting, and to provide care rapidly and effectively.” The University of Toledo Department of Psychiatry has multiple research projects investigating approaches to caring for patients in crisis, or immediately after crisis, and is actively studying the best way to provide a full continuum of care for mood disorders, to prevent gaps in care and unnecessary relapses. 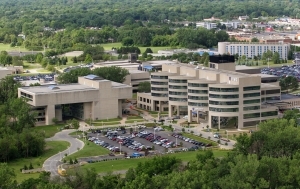 “Education is a critical part of our program,” said Dr. McCullumsmith, “and we are excited to embark on interdisciplinary learning experiences combining medical students, nursing students, physician assistants, psychology graduate students and residents to provide the best quality team care for patients.” The University of Toledo emphasizes collaborative care for both depression and substance use disorders throughout its health system. As a member of the NNDC, the University of Toledo will benefit from collaboration with NNDC Member Centers across the country, providing opportunities to learn how best to structure and grow the kinds of collaborative care programs it offers for mood and substance use disorders. Promote measurement-based care, quality improvement, and research through the NNDC Mood Outcomes program available for use at NNDC member sites. The National Network of Depression Centers (nndc.org), a non-profit 501 (c)(3) collaborative research network, unites mood disorders experts from around the country to harness the collective power and resources of network members, seeking to expedite scientific discovery and advances in patient care for people with mood disorders. Its membership includes many of the nation’s top medical institutions. Acceptance involves a rigorous application process detailing expertise in and commitment to interdisciplinary clinical delivery, research and education.